How do you win Best Game Design at the German Video Game Awards? Why in hell do you need more than 5 years for that? 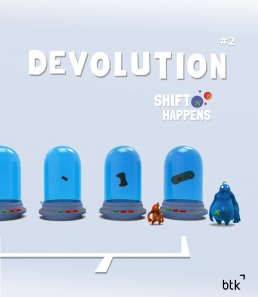 We are more than happy to welcome Shift Happens and its two game designers Mathias “Matt” Neukam and Stefan “Beff” Fischer from Klonk Games to our next Devolution event! You can look forward to an in-depth and honest exploration of the development process of Shift Happens, with all its ups and downs, experiencable through playable versions of the game and told by the responsible game designers themselves. Explore the creative process behind the more than 5 years development of Shift Happens! We are looking forward to see you all! Klonk Games is a small indie game company in Munich, founded by alumni of the MD.H Mediadesign Hochschule, working on own game concepts as well as doing contract work. Shift Happens started as a prototype for a school project and was later released as Mercury Shift on Kongregate where it got a quite good reception. The team decided to fund Klonk Gamesand develop the game further as their debut, wanted to implement all the things, that either did not work out in the first version or were recorded in various feedback sessions. Shift Happens was released in 2015 on Steam Early Access. The full game will be released in July 2016 on Steam and Xbox One. Mathias “Matt” Neukam & Stefan “Beff” Fischer are the two game designers mainly responsible for the creative decisions behind the evolution of Shift Happens. Devolution is a free game design focused event exploring the creative process and challenges of game development. Each event focalises on the evolution of a game through theexhibition of prototypes and interim versions and an in-depth conversation with the developers. How did the game change during its development? Why? Which features were added? Which were taken away? When? What were the interesting design challenges? What was the original vision of the game? How did the idea emerge? How did certainfeatures evolved into their final version? How did testing and feedback affect the game? What the hell is creativity? What is the connection of all this to business and technology? What might the future hold? Please RSVP that we can have a slight notion of what to expect.